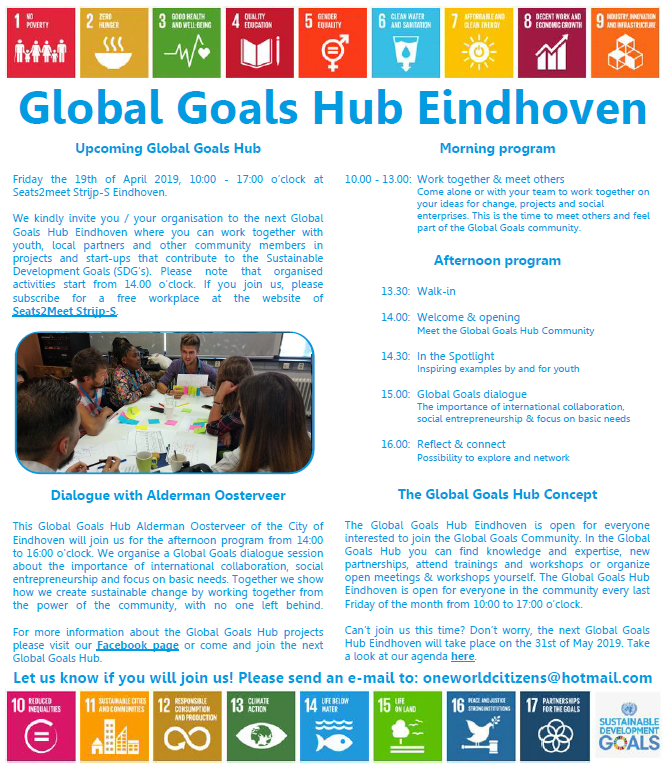 Just a small reminder that you’re invited to the upcoming Global Goals Hub Eindhoven which will take place this FRIDAY THE 19TH OF APRIL 2019 from 10:00 to 17:00 o’clock @ THE HUB EINDHOVEN (Vestdijk 25, 5611 CA Eindhoven). Please PAY ATTENTION to the location! The location is in walking distance of the Eindhoven Central Station. Because of the visit of Alderman Oosterveer of the City of Eindhoven we organise a SPECIAL PROGRAM from 13:30 to 16:00 o’clock. Please find more details about the program in the invitation in the attachment.